The other slight problem is that you get a few wax particles in your honey. There are several ways to deal with this --- you can strain the honey through a finer sieve or cloth, or you can wait until the wax floats to the top of the jar and just skim it off. Or you can do what I do and just savor the honey, wax and all --- the tiny specks aren't really noticeable. Our chicken waterer keeps your coop sanitary and your chickens healthy. We use a crock pot + temperature controller to hold the honey at a precise temperature without supervision. 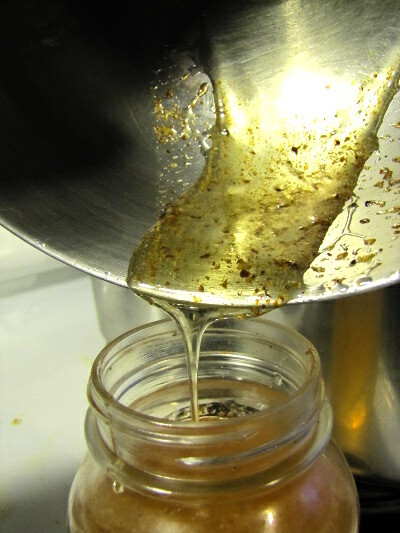 The results is a clean separation of wax from honey using a metal filter. This is quite similar to your technique, but might give you some new options. Short and sweet --- I liked it. It looks like you're using plastic foundation, thus the butter knife?